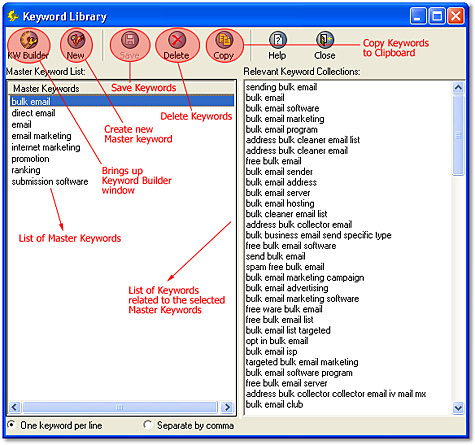 Keyword Library is a keyword database with collections of Master keywords and Relevant Keywords describing your web site, that you can access and retrieve anytime. With this feature, you can easily reuse, store and manage relevant keywords for your web promotion use. 2. Click the "Keyword/Keyword Library" item from the menu bar to pop up the "Keyword Library" window. 3. Click “New” icon to add a new master keyword.